Mr T opted for sopa Menorquina as his set-menu starter at La Guitarra in Ciutadella de Menorca one rainy lunchtime and its simple, straightforward heartiness really hit the spot. Unlike Cafe Baléar, however, La Guitarra is one place I wouldn’t advise opting for the menu del dìa; for although the restaurant has a great reputation for local specialities its à la carte menu is very obviously the focus. One lives and learns all the same: its troglodytic charm would be a wonderful escape from the heat of Summer and descending from scorching street level into its stone-walled cellar-cool basement interior for a slap-up meal is what we’ll be doing next time, but in the interim I recreate this Balearic soup with fond remembrance of Menorca’s old capital in the Spring. 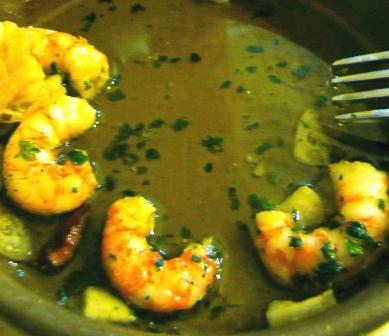 I wished I had ordered the sopa too as my garlic prawns were just that; peeled prawns with overcooked garlic and despite their toothsome texture, not much flavour in either. We both ordered the sea bass a la plancha for mains and it was ok; fresh and decently cooked but decidedly dull! The highlight of our lunch was so obviously the working man’s vegetable soup that it demonstrated how plain food doesn’t have to be plain. 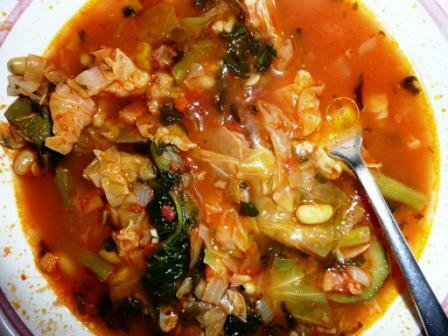 This hearty soup could easily be made fit for a vegetarian – vegan even – by the substitution of the small amount of meat with extra olive oil, garlic and paprika. 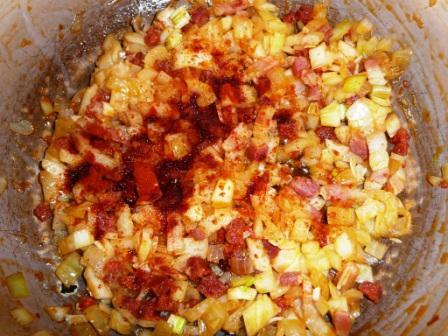 On the other hand, if you’re a meat-eater but can’t get hold of sobrassada or chorizo, substitute pancetta or lardons and throw in extra pimentón (unsmoked, for a change) and garlic. Chop or tear all the vegetables into pieces of approximately equal size. 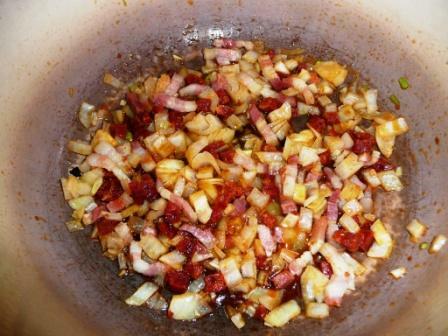 Heat oil in an enamelled cast iron pot and sweat the onions with the sobrassada, garlic and pimentón on a medium-low flame. Add the diced tomato and bring to a gentle simmer, then add the rest of the vegetables and cover with two cups of hot stock. Simmer for 20 minutes. but unless it has just baked a loaf of bread, there’s no reasonable reason to whack on the oven specially, so I have been known to serve the soup straight from the pot: topped with a spoonful of homemade ricotta, a trail of olive oil and with slabs of toasted country bread on the side nobody minds one jot. 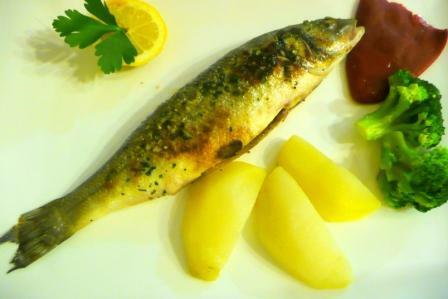 Incidentally, at La Guitarra we ordered a bottle of Blanc Pescador, assuming (rightly!) its name denoted an affinity with fish, but as my Spanish vocabulary was not up to anticipating its pétillant tingle – “vino de ajuga” translates to “needle wine” apparently – it came as a pleasantly prickly surprise, and with a much cleaner and clearer flavour than el crudo cava, an awful lot more dignity too.